While I worked on this blouse,I thought I’ll do something in lagartera embroidery for myself, I haven’t done so far. After working the squares on the motif with satin stitch in orange thread[ the picture I had not taken] , I started with yellow thread. 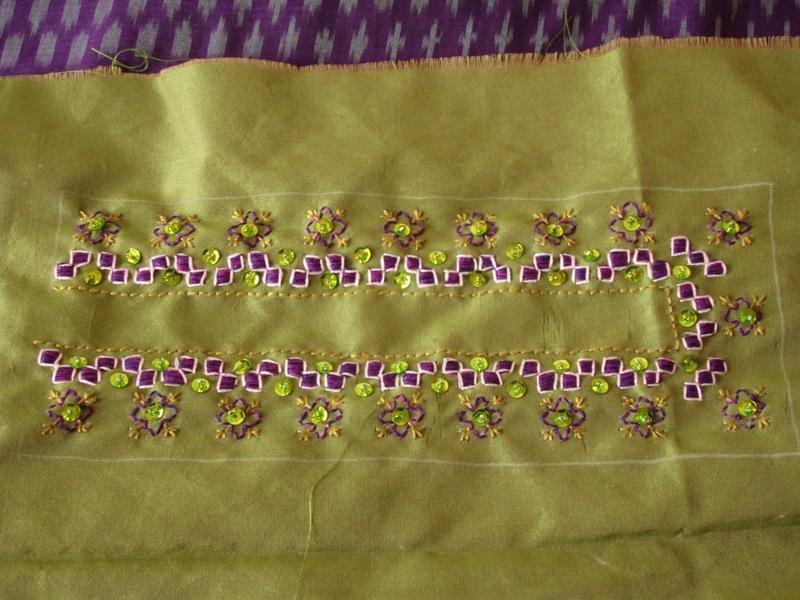 In this thread the bottom border pattern was worked in back stitch, and then the whole embroidery was outlined with the same yellow thread .I had initially ,tried with a deep yellow, which did not go well with the other colours and the fabric, so I changed to this shade of yellow. The embroidery is fully completed, I have given it back to the lady. I enjoyed working on it. Hoping to do a similar one in the future. Till now I have not received any informative feedback on , the work I have been posting under the heading’Lagartera’.So , may be this is lagartera embroidery. I have doubts because, the pattern is not taken from the lagartera embroidery book, its my own. After filling the shapes in satin stitch, and curved lines in back stitch with green thread,the alternate diamonds on the top border pattern is filled in satin stitch in dark red colour. 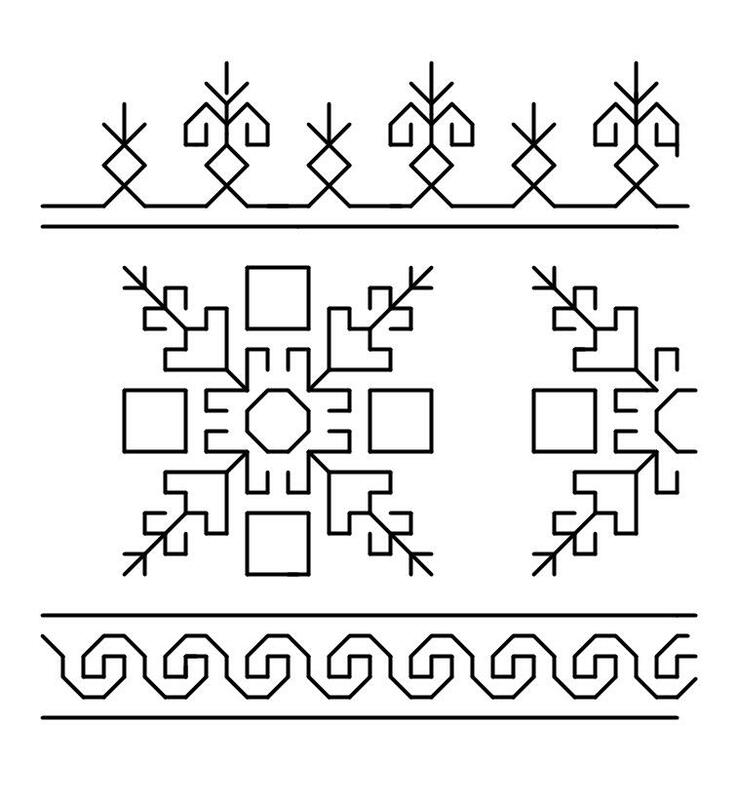 The centre of motif repeat pattern , is done in Rhodes stitch. The back stitch outlines are also done with the same red thread. 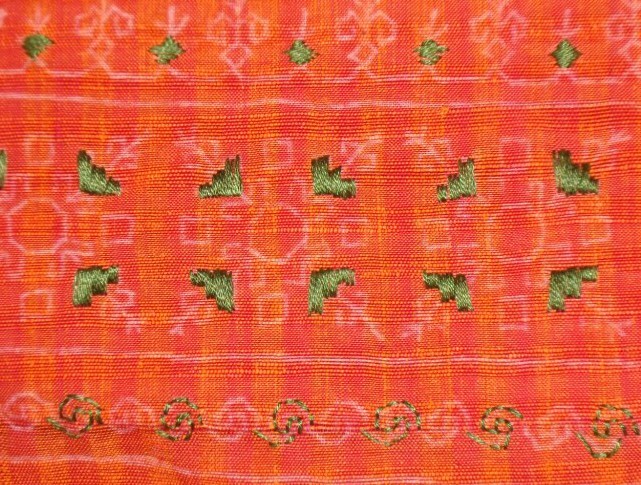 After this,the squares on the motif are filled with satin stitch in orange thread- which I forgot to picture. The colours were all chosen by the lady , for whom I did this embroidery. further details on my next post. I have come back from Chennai vacation. Too many activities in two weeks. Did not have time to post any new pictures too. I have seen a few samples of lagartera embroidery on net. The original work Iam yet to see.then found a book of lagartera embroidery, from that deduced that it can be worked on even weave,consists of satin stitch, cross stitch and back stitch.With this background information, I wanted to work this embroidery. chose the colours, and agreed to my suggestion of lagartera embroidery . 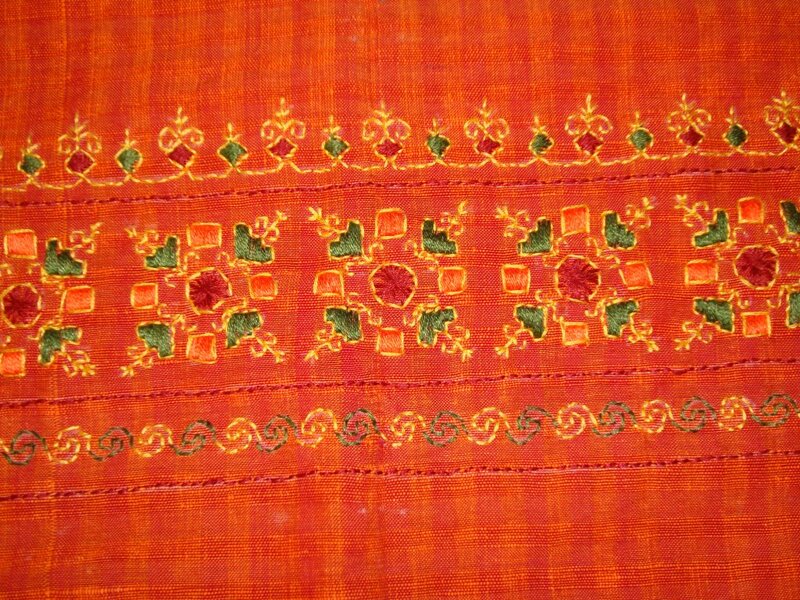 The blouse material was handloom cotton in dark orange and did not have even weave. So the patternwas drawn on graphand copied with white carbon paper on to the fabric. Instead a long rectangular yoke I wanted a U- shaped yoke. So the pattern is cut in the middle for this effect. This was an easy embroidery pattern .I worked on it for 6 hours in three days. 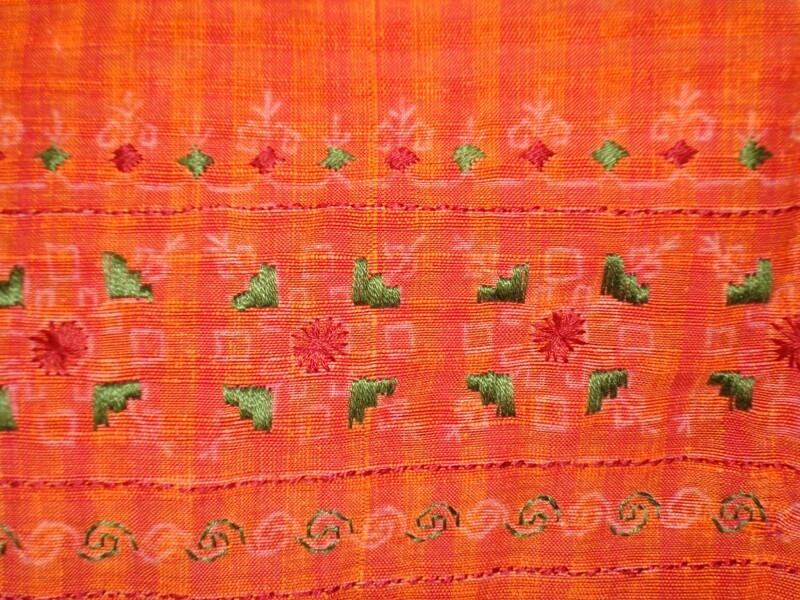 these type of simple designs are found often on Indian tunics available in shops. For casual wear , in summer , this is perfect. 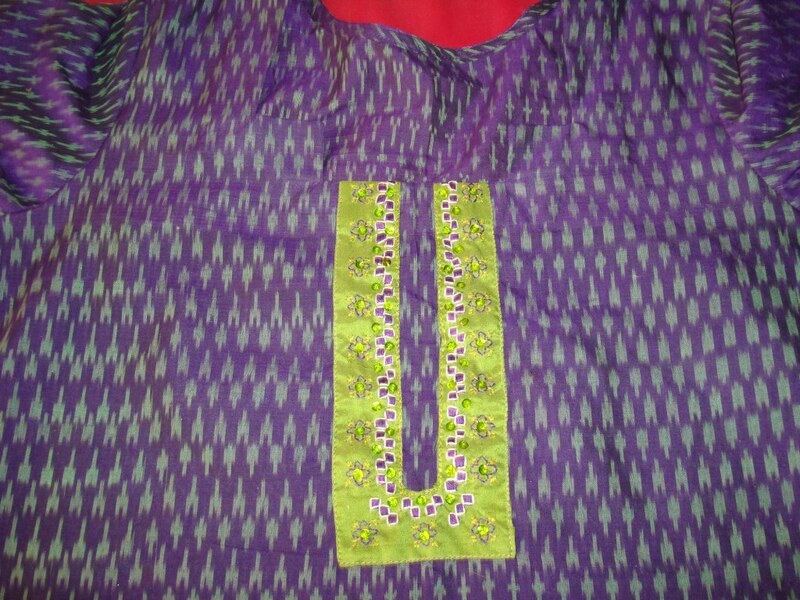 Embroidering the yoke for this violet[ Ikat weave] tunic in Lagartera inspired pattern was completed. 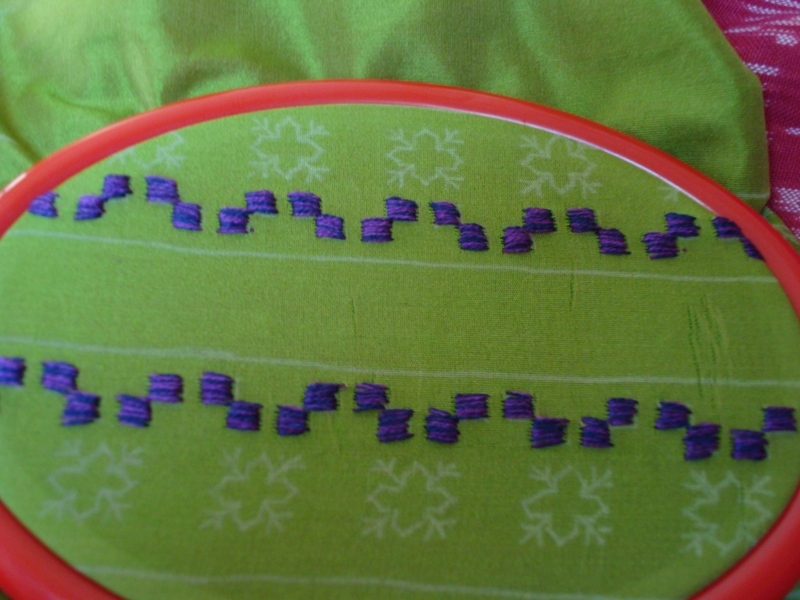 The centre was lined in back stitch in green. The satin stitches are outlined in white thread. 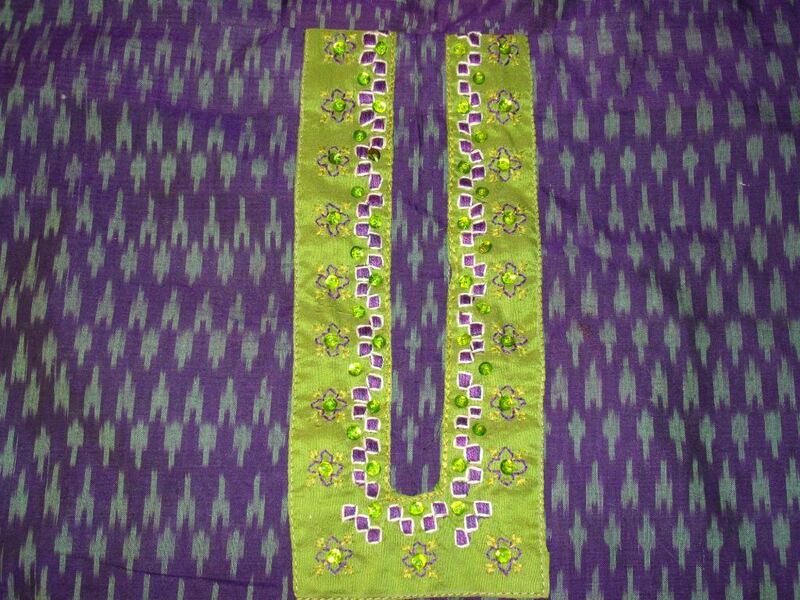 The motifs around the satin squares are done in back/holbein st in violet and green colours with sequins in the centre. The tunic with the yoke sewn on my next post. 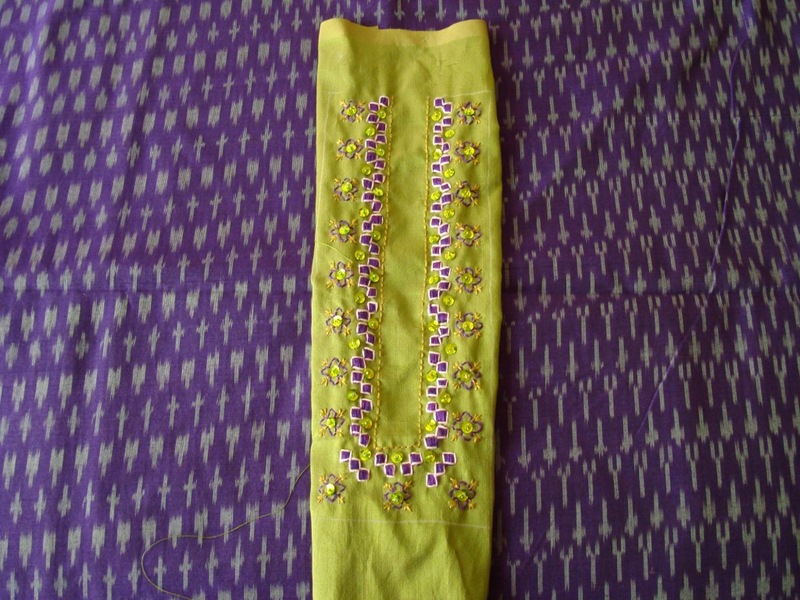 It started with- I was left with a light green patiala salwar[Indian pants with lots of folds].I had sewn that for a lemon yellow chiffon tunic. They did not match very well.I finished that tunic set by buying another green[with yellow stripes]. Now this green salwar was sitting idle. 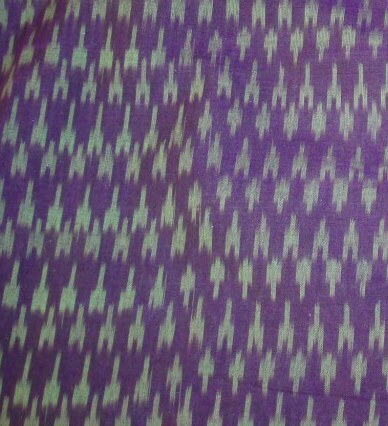 I found a violet [ not exactly violet, but more of blue, this I learnt when I was choosing the right thread} and green material ikat weave. Here it looks like grey, but it is green. I wanted to do something simple for yoke, just to complete the embroidery quickly! I was a slightly fascinated by lagartera embroidery at that time and wanted to try my version. Completed yoke on my next post.